As much as we love styling our mane, sometimes we act like the limit does not exist. But it does – and overdoing it on the regs is actually a common cause of hair loss. We sat down with hair re-growth expert and bonafide miracle worker, Lars Skjoth, Founder and Head of Research & Development at Harklinikken, to find out the how’s and why’s of lock loss, and what you need to know to reverse it. There are many different causes of hair loss or thinning, and as Lars notes, most hair loss is attributed to “an interaction between genetics and hormones.” Though this type of hair thinning has many names (hereditary hair loss, genetic hair loss, male and female pattern baldness, androgenetic alopecia)—it all refers to the same type of hair thinning. “Hormones carry out the ‘order’ from the genes to attack follicles, which ultimately causes the hair follicle to shrink, resulting in gradually thinner hair,” explains Lars of this vicious internal cycle. Stress, and poor sleep or sub-par nutrition, can also accelerate the thinning process, as your lifestyle has an impact your hormones. Aside from traction alopecia and genetic factors, hair loss can also come about because of an illness, eating disorder, or as a side effect of medication and is common post-pregnancy. When dealing with traction alopecia, knowing which products are less likely to cause damage or mess with your hair growth is key. 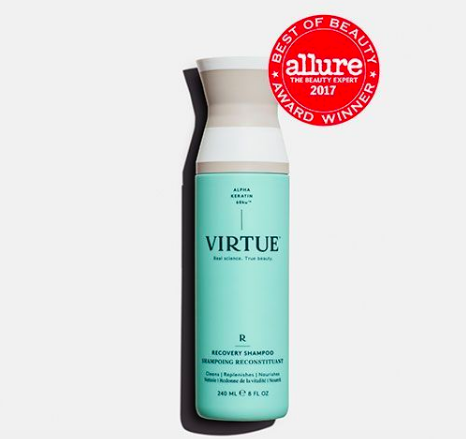 For everyone who’s come to rely on dry shampoo post gym or to prolong a blowout—it’s time to tune in. According to Lars, “dry shampoo is the worst thing you can do to your scalp if you are concerned about hair loss.” Lars explains that dry shampoo may seem innocuous, but it can actually cause serious problems for your scalp, especially if not handled correctly. “Dry shampoos are not shampoo,” he emphasizes. “Dry shampoo does not cleanse your scalp or hair at all, it only gives the illusion of recently cleansed hair thanks to chemicals and powders that can clog the hair follicles and throw off your scalp’s pH balance,” he continues. “They often irritate your scalp, can cause dermatitis (scalp infection), and sometimes, with extensive continued use, lead to hair loss and hair thinning. In general, however, there are hundreds of chemicals that are bad for the scalp that are used in dry ‘shampoos’ as well as other styling products—these chemicals are present to create styling effects but many of them can cause damage to the hair, scalp and hair follicles,” he warns. Lars adds that most of the chemicals used in styling products are shockingly, “not meant to be exposed to the skin,” though this is obviously difficult (if not impossible) to avoid. Aside from being attributed to hair loss, the particles present in certain products can also build up on the hair strands, resulting in dull, limp and lifeless hair. Instead, when choosing shampoos or hair styling products, Lars advises that if you care about your mane, reading the ingredients is a must. He recommends avoiding any product that contains: Color, Perfume, Diethanolamine, Propylparaben, Butylparaben, Isobutylparaben, Methylisothiazolinone, DMDM hydantoin, Coumarin, Geraniol, Octinoxate and Amylcinnamaldehyde. Luckily, all hope is not lost. Lars is a pioneer of the Harklinikken treatment, which has clinically proven to stop and reverse hair loss. The treatment consists of a topical, non-invasive product regimen based on plant technology and proprietary ingredients from milk. “For the past 26 years it has helped over 100,000 individuals worldwide achieve longer, stronger, thicker hair,” says Lars. Which brings us back to traction alopecia. While many hair follicles are affected by overstyling, your mane is not necessarily completely destroyed with this type of hair loss. This means there’s still a chance that it can be partly or completely restored and growth can occur. “Harklinikken´s program is clinically proven to enhance existing active follicles by increasing the number and quality of hairs that grow there. This means, the areas where hair cannot grow are more easily covered/hidden by your own hair,” he notes. The Harklinikken Hair Regrowth Program includes a daily application of a customized extract, which is applied directly to the scalp, as well as the use of specialized shampoos, conditioners, and hydrating products designed especially for the treatment of thinning hair (and formulated without artificial color, perfume, silicone, sls/sles, petrochemicals, parabens or other known problematic preservatives). “The custom-blended extract is the cornerstone of the treatment and contains proprietary ingredients derived from cow’s milk, burdock root and marigold along with natural occurring sterols, tannins and fatty acids from botanicals,” says Lars. The prescribed extract, along with a personalized regimen optimizes conditions for hair growth, improves blood circulation, reduces scalp irritation and encourages the development of healthier scalp and hair follicles. As your hair is constantly in flux, the extract is also continuously updated throughout the course of the treatment to ensure maximum benefits. “ Most clients will notice a difference in their hair growth in as little as 3-4 months, and we help the majority of clients get between 40-70% of their hair back,” he explains. The Harklinikken program is best for those suffering from male and female pattern hair loss (specifically, androgenetic alopecia) though Lars points out that it works for anyone who wants fuller, thicker, longer hair. Harklinikken is a stand out treatment program as it only accepts clients if the team determines that individual will be a successful candidate—and actually be able to achieve hair re-growth—that being said, everyone can receive an evaluation. No matter your situation, when it comes to hair loss, Lars’ explains that the best approach to your hair is being preventative. “Most women don’t notice they are thinning until they have already lost 40-50% or more of their hair,” he confirms. And although we typically associate the condition with aging, this isn’t necessarily the case. “Hair thinning can start at any age,” says Lars, noting that in some cases, it can occur much younger than one would expect. Whether you opt for the Harklinikken Hair Regrowth Program or just decide to take your styling down a level, practicing a daily routine and taking special care of your scalp will help prevent – and even cure – traction alopecia. Want to fake re-growth while while you wait for your tresses to come back? HERE’s how Scalp Micropigmentation works.